As the director of the National Greyhound Adoption Program for the past 20 years, I have long felt that exploratory surgery is the one means of truly finding out what is going on on the inside of your pet, whether it is my greyhound's body or yours. Ultrasounds will sometimes help to determine an issue but they are often inconclusive and don't give us nearly enough information. An exploratory surgery affords the opportunity to inspect most of you greyhound's vital organs without actually disturbing bodily function. At best, an exploratory can conclusively, without a doubt, tell you if your dog has cancer on its liver, intestines, stomach, or other vital organs and at its least, can potentially indicate the likelihood of cancer based on tumors, growths, discolorations, swellings, and obstructions as well as other signs. There are many non-cancerous conditions that can still be terminal for your pet. 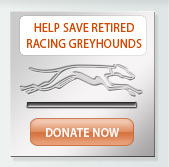 The one major organ that you can be remove without drastically affecting your greyhound's life is the spleen, assuming that it does not have a cancerous tumor or growth and is possibly simply engorged or has a tumor or growth that is benign. On April 12, 2011 we did an exploratory surgery on Tizzy. Her history indicated that she had been losing weight for several months although she was eating regularly. An outsourced ultrasound indicated a 12-15cm mass. 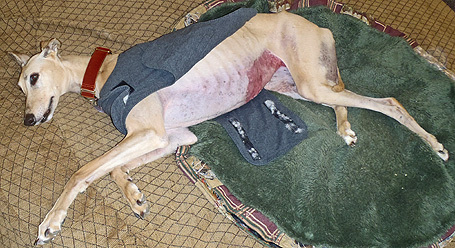 The adopters had a choice of paying $3000-$4000 for surgery to remove the spleen elsewhere or to euthanize their greyhound at a specialty facility, or paying $1500 at National Greyhound Adoption Program to perform an exploratory. 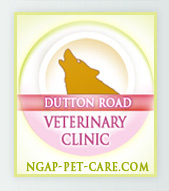 The adopter chose NGAP to do the exploratory surgery knowing full well there was a high risk that, based the dog's physical condition, she might not survive the surgery, that the mass could be cancerous, but also knowing that the dog they dearly loved might have a chance at survival. 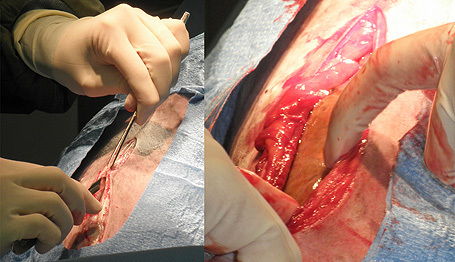 Our two staff veterinarians, who jointly performed the surgery, began cutting open the body cavity to access the spleen. They cut and cut and cut an ever longer opening. We have never opened a dog to the extent that we opened Tizzy's body cavity. The mass that we removed was truly gigantic, approximately 14 inches long. A normal spleen is 8-9inches in length. 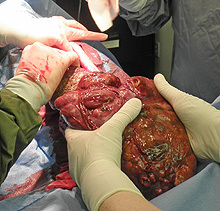 Aside from the size, the spleen was unremarkable and not engorged but had an attachment that was the size of a human head. 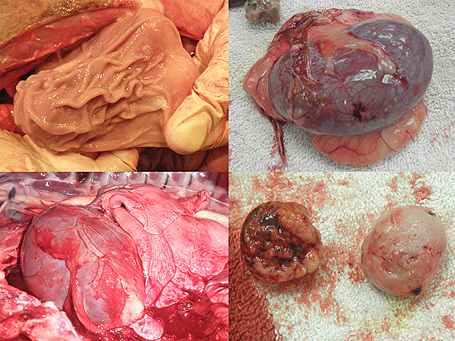 The combined mass of the spleen and the growth weighed 8lbs. A normal spleen would weigh approximately 1 to 1.5 lbs. 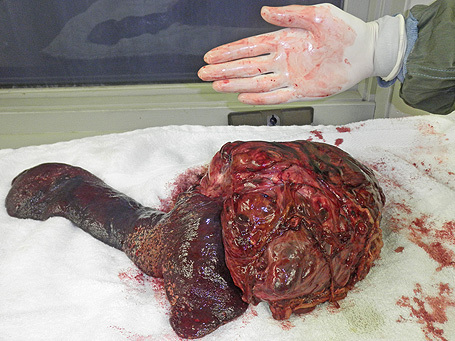 The photo below with the gloved hand shows the spleen to the left, which itself was engorged, and the mass attached to the spleen to the right. In order to remove the spleen once it was outside the body, one person had to hold the combined mass while it was slowly and carefully tied off. It was quite an experience for everyone in the operating room and reaffirmed to me the value of exploratory surgery. We certainly do not do this procedure without keeping in mind the inherent dangers of lengthy surgery and anesthesia. The surgical part of this procedure took over 2 hours. If it had been a normal spleen removal, that time could have been cut in half and the number of staff involved could have been cut in half. But for the cost of an MRI, we not only found the problem but removed it and an MRI cannot determine whether a growth is cancerous or not. Tizzy survived the surgery, and gained all of the weight she had lost from the mass removal. For several weeks, Tizzy thrived. Unfortunately, the mass was biopsied and came back positive for hemangiosarcoma. Tizzy returned to our clinic on June 17, 2011. She had not been eating and her stomach was significantly distended. The adopters had decided to euthanize her. Upon euthanasia, we opened the body cavity and blood just poured out of her body. She had significant blood loss and probably would not have survived another 24-48 hours. The first organ that we were faced with, was her liver that had very large nodules surrounding most of the surface of the liver. 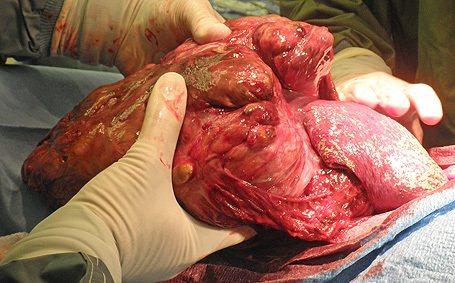 The liver was removed, the stomach, as photographed was full although the dog had not been eating. Upon opening the stomach walls, air was released and the stomach that was quite large was full of foam and grass. Her stomach wall lining appeared quite normal and had not had any cancer related issues. Her kidneys may have had some small amount of cancer on the surface and there were some nodules on the inner walls of her body. When opening up the cavity around her lungs and heart, those organs appear to be quite normal and healthy. There were some round growths smaller than a golf ball attached and shown in photographs that we could not determine precisely what they were. Upper Left: The stomach - soft, supple, flexibe. Upper Right: One kidney. Lower Left: Healthy heart and lungs. Lower Right: Unidentifiable masses. It was fortunate that Tizzy's owners brought her in the day they did, rather than let her suffer. 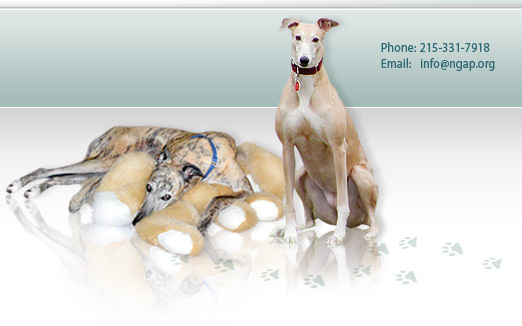 We wish to thank Tizzy's owners for allowing us to learn from Tizzy's condition so that we might use this knowledge to help other greyhounds in the future. Rest In Peace, Tizzy. Run free!